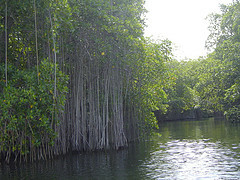 The town of Black River Jamaica is situated close to the banks of the river after which it is named. 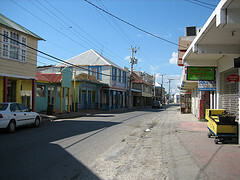 The capital of St. Elizabeth, it is one of the oldest towns in the island. The town itself is quaint and beautiful, looking as it does southward, toward the shimmering blue Caribbean Sea. The Town was designed by the Leyden brothers of England, three wealthy men who were substantial land proprietors in the area. Today, it is nothing like the busy seaport town it was in the 18th and 19th centuries, when the area prospered from the lucrative log wood trade, exports of rum, pimento and cattle skin garnered from nearby Holland, Vineyard and Fullerswood Estates. The town itself, because of its port then, was vital to the slave trade. Slaves were brought here and sold at auction at Farquharson Wharf, originally called 'Town Wharf', which is still standing. Over time, the town grew in size and importance and in 1773, it replaced Lacovia, located some 19 miles to the --east-north-east, as the capital of St. Elizabeth. It soon became the main commercial, economic and transshipment centre of the parish. By the early 1900's the town was second only to Kingston, the national capital, in importance. The town has many important historic sites and structures and the buildings are of varying architectural styles. 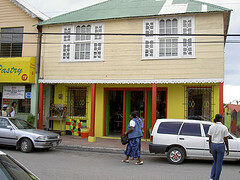 You will find examples of Georgian, Jamaican Georgian, British Colonial and Jamaican Vernacular architectural styles. The predominant ones however, are Georgian and Victorian, which reflect the different periods in the history of the town's development. Some of the notable structures here in Black River, Jamaica includes the Black River Anglican Church, the Waterloo House, the Magdala House, the Invercauld Great House, the The Black River Hospital and the The Black River Court House. On April 8th, 1999, the town of Black River was designated a Protected National Heritage District by the Jamaica National Heritage Trust. The Black River itself was for years believed to be the longest river in Jamaica until recent research reveals that this position is held by the Rio Minho which is 92.8 km long. It was originally called Rio Caobana (Mahogany River) by the Spaniards. 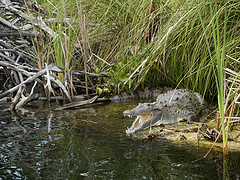 It is a habitat for the Jamaican Crocodile and is used for fishing and river boat tours by nature lovers. One of Black River's popular attraction is The Black River Safari Tour which offers visitors an exciting six-mile trip up the Black River to see its wildlife and complex ecosystem. The mangroves that grow close to the banks of the river are a haven for over 100 species of birds, crabs, fishes, frogs, crocodiles and other wildlife.